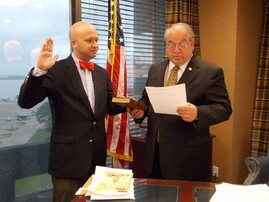 Assistant District Attorney Tony Fazzio was recently sworn in by District Attorney John DeRosier. Fazzio is now a misdemeanor attorney for the Calcasieu Parish District Attorney's Office. After graduating from Louisiana State University with a degree in Biological Sciences, Fazzio graduated with honors from the LSU Paul M. Hebert Law School in 2010. Prior to joining the Calcasieu Parish District Attorney's Office, Fazzio worked for a regional law firm representing lending institutions in the area of mortgage banking law. Fazzio is a Lake Charles, LA native and a graduate St. Louis Catholic High School.